One of the Many Great Brands! Coconut milk is a milky white milk-like substance that is obtained from a mature coconut. There are many uses for coconut milk, especially in cooking and there are many coconut milk recipes that can be used. There are also many benefits of coconut milk when used in recipes that can help your family become much healthier. Whereas coconut water comes from young coconuts, coconut milk comes from mature coconuts! While we love coconut water (the entire basis of this site), we figure we should talk about coconut milk, coconut meat, coconut oil, and everything else too! So Delicious Coconut Milk is one leading brand of milk that sells liquid coconut milk. You can also buy coconut milk powder and coconut cream. Wilderness Family Naturals is a leading brand of coconut oil. These different coconut products can be used in different ways in a coconut milk recipe depending on what the recipe calls for. One such recipe is coconut milk ice cream recipe. You can just use a regular ice cream recipe just substituting where the recipe calls for regular milk with liquid coconut milk to make your coconut milk ice cream. You can do this with other recipes as well, such as chicken curry with coconut milk. Any recipe that calls for milk in cookbooks can use this substitution. Coconut milk nutrition can be a concern to cooks who are wanting to use this as a substitution for regular milk, especially in regards to saturated fat. But studies have shown that in regards to the milk of a coconut is the good kind of saturated fat. 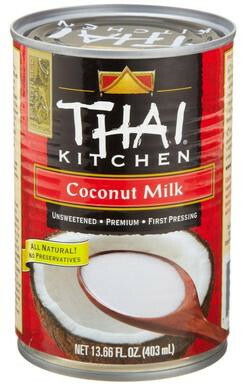 This makes it a very healthy option to use while cooking, which leads to coconut milk benefits in your diet. Coconut oil also contains medium chain fatty acids which are much healthy than long chain fatty acids which is found in most diets. You may wonder how to make coconut milk or even exactly what is is. It is not the liquid that is found in a raw coconut, but instead it is diluted cream that is pressed out of the actual meat of the coconut. It is actually fairly easy to make at home. All you have to do is crack a coconut open and then use a knife to pry the meat out of the coconut. Then you can put the coconut meat into a blender. Once the meat is pureed, take it out of the blender. Put it into a paper towel or a mesh towel, and squeeze the milk out. You can repeat this process to get the most milk out of your coconut. Making your own milk of the coconut at home can be a bit time consuming, but it can save money rather than buying the pre-made version. Home cooks just need to decide if they would rather save time or save money. Either way, using the milk of coconuts is a much healthy alternative to regular milk when cooking. Coconut milk benefits can be far reaching when you begin to use them on a regular basis. You can buy it pre-made or you can make it yourself at home. Either way, substituting the milk from coconut meat instead of cow’s milk in cooking can give your family a lot of health benefits.